Constantly tired lately, no matter how many hours you have slept? Still remember those days you were a “super-human” that you work hard and excel at what you do without much sleep or rest? Ever wonder why your body/energy can’t bounce back like before? 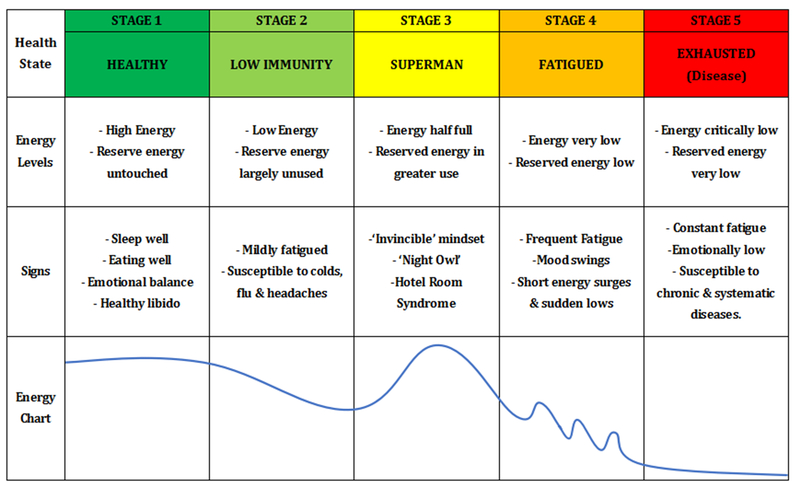 As a Chinese Medicine practitioner, I view fatigue and energy recharge following a common pattern that can be summarised as “5 Stages of Human Health’, which outlines in the Table below. * Inspired by Qingzhong Wu, “The User’s Manual For Human Body” (Chinese Edition) 2005. Let us look at these five stages of human health shown in the table in more detail. In Stage 1 we are at the optimal level of health; we are full of energy and so our reserve energy remains untouched and well preserved. Our sleep is good, we enjoy a balanced diet and good digestion and bowel movement; we also exercise well and feel emotionally stable and well-balanced. However, if we push ourselves hard and fail to recharge regularly through good sleep, diet, and restorative exercises and mental relaxation, we will fall into Stage 2. In Stage 2 we are mildly fatigued or what I call ‘Low Immunity State’. Our body has less energy – but our reserve energy remains largely unused. As we have the lower energy we are more susceptible to minor ailments like colds, flu and headaches. If we do not recharge properly through the right means, we enter Stage 3. In Stage 3 our energy levels fall just below half full. However, as we keep pushing our body forward at full pace, our reserve energy is put into greater use. This gives us an energy surge, and a temporary feeling of invincibility; so we do more than we are normally capable of, which is why I also call this stage “the Superman State”. I’ve seen many businessmen, entrepreneurs, hyper-driven students and even some mothers fall into this category. Tell-tale signs of people in this stage include: the need to be constantly occupied with something and unable to sit still, night owls whose brain activity peaks in the late hours and, what I call the ‘hotel room syndrome’ where as soon as you reach the holiday hotel room you are hit by a nasty cold or flu – which is your body’s attempt to use the downtime to fix and recharge itself. But people at this stage often repress the natural healing process with strong medication in order to get back to full activity as soon as possible. And rather than restore energy through good sleep, diet, exercise and so on – the false sense of invincibility often leads to more destructive patterns i.e. late nights, overeating, high intake of fast and processed/junk food, high alcohol intake and no exercise or fanatic in extreme sports that further depletes the reserve energy. Sooner or later this all takes its toll as the body runs even shorter on energy and reserve energy and enters Stage 4. 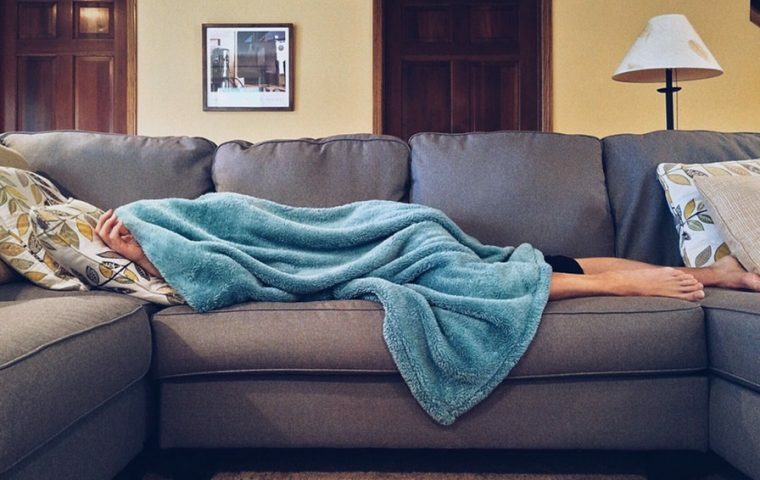 Due to our genetic traits, so some may have more of it than others; but, it is also a limited resource so will ultimately run out if you persistently fail to rest and recharge whilst leading such a full-on lifestyle. In Stage 4 our energy and our reserve energy are both running low and we are physically fatigued much of the time. We may have momentary surges in energy if we push ourselves using our reserve energy but these short surges are followed by a sudden low. These highs and lows are matched with mood swings. More prolonged and serious illnesses that are harder to recover from may also start to arise and persist at this stage. If we fail to see these physical and emotional warning signs and continue to drive on without stopping for a substantial recharge we will reach stage 5. In Stage 5 our energy is at emergency low levels and our reserve energy is also running extremely low. We are fatigued and emotionally low and are susceptible to chronic and systematic diseases (a weak body and negative emotions provide a fertile breeding ground for disease). Recovering from this stage and its associated diseases becomes an uphill struggle as we are low on the reserve energy that is designed primarily to help us fight such emergency problems. Medical intervention is usually required at this stage.